From May to October each year since 1937, families have been welcomed to Severn Lodge by the Breckbills to experience and share all that this beautiful 100 acre lakeside resort has to offer. Carefully preserved white clapboard buildings combined with all the modern amenities create a vacation destination that provides up-to-date convenience while retaining the hospitality and ambience of a bygone era in the Muskokas. Situated in a sheltered cove on the northern shore of Gloucester Pool, over 2000 feet of private shoreline overlook rock and pine covered islands creating a tranquil, relaxing setting with spectacular sunrises and sunsets. Severn Lodge offers all-inclusive American Plan or Housekeeping Plan Packages, both of which are available all season long with special early/late season discounts and family rates. See Accommodations, Recreation and Dining for more details. Click Below or scroll for package details. For package rates Click Here. Delicious Dining - 3 meals daily according to the package. Recreation Facilities - please see full list. Severn Lodge offers Modified American Plan Packages at various times during the spring and fall months. These packages differ from the American Plan Packages in that they include 2 meals daily (breakfast and dinner) instead of 3 meals daily. Severn Lodge has some housekeeping cottages and suites that have cooking facilities. The main difference between the Housekeeping Plan Packages and the American Plan Packages are that no meals are included in the Housekeeping Plan Plan Packages. Please check directly with the resort for details. Choose from 3 types of waterfront accommodations under Severn Lodge's American Plan Package. 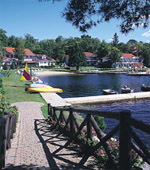 The hotel rooms, family-sized rooms and two bedroom units are housed in clapboard buildings with connecting cobblestone walkways to the Main Lodge. Hotel Style Rooms - warmly appointed hotel style rooms with a view of the waterfront. Many rooms are large enough to add a cot/crib. Suitable for couples or families with 1 or 2 children. Family Sized Rooms - one large room with 2 sleeping areas towards the rear of the unit separated by a dividing wall. There is 1 queen bed on one side of the wall and 2 single beds on the other side. The front of the room has a sitting area with a hide-a-bed couch. Perfect for families with 2 or 3 children. Two Bedroom Units - the rear bedroom has 2 single beds or 2 single and 1 double bed, and the front bed-living room has 1 queen bed and a hide-a-bed couch. Perfect for families that want the privacy offered by two separate sleeping rooms. The 3 Bedroom Homestead Suite, Hillcrest Studio Suites and the Westview Cottage are all offered under the Housekeeping Package. 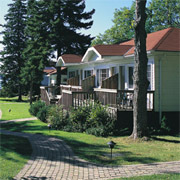 The Suites are located in buildings on the main resort property. The Westview Cottage is a 1 minute walk away, offering more privacy. Severn Lodge vacationers booking either the American Plan or Housekeeping Packages have full access to all the recreational opportunities available at the Resort. Enjoy a scenic leisurely island tour aboard Severn Lodge's 1922 antique and classic Mahogany Motor Launch or relax by the stone fireplace with wide screen TV in the Lakeside Recreation Building. A games room is also available. $ indicates activities that are an additional charge for all guests. Severn Lodge provides fully supervised children's programs for ages 2-4, 5-8 and 9-12 years daily during the summer months for guests on the American Plan or Housekeeping Package. In addition to nightly summertime entertainment, there are selected other evenings with beach bonfires, hot dog and corn roasts, movies and more. Informal activities are offered for teens taking advantage of all the recreation facilities at the Resort. The Supervised Children's Programs are designed for kids to make new friends and have fun. Flexible participation in the programs allows for family time too!! Most meal times are family meals also. Enthusiastic Staff, together with creative toys, arts and crafts, stories and outdoor play equipment, make this program fun and stimulating for youngsters. Nourishing snacks are also supplied. Fun-filled daily themed activities that explore nature, history and culture are combined with hikes, competitions, picnics, bon-fires, hot dogs and corn roasts. 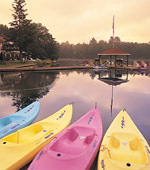 Water activities may include water-skiing, tubing, swimming, canoeing and fishing derbies. Severn Lodge recommends that non-swimmers and young children bring and use life jackets. The Main Lodge Dining Room is open for breakfast, lunch and dinner. Waterfront views and delicious menu items made with fresh ingredients adds to the dining pleasure at Severn Lodge.